Morwell is the largest city in the Latrobe Valley, 150 km east of Melbourne, with about twice the population of Moe, which is a little closer to Melbourne. Primarily a product of the open cut brown coal mines of the State Electricity Commission of Victoria, successive governments invested heavily in Morwell, with a power station, briquette factory and over 2000 houses built by the Victorian Housing Commission. With the demolition of Yallourn in the 1970s, Morwell’s centrality continued to grow. But like Moe it has suffered from the privatisation of Victoria’s electricity manufacture and distribution. Its population fell after 1991, it is slowly growing again, but more from retirees than new jobs. Morwell lies in the valley of the Latrobe River, with the Great Dividing Range to the north and the Strzelecki Ranges to the south. 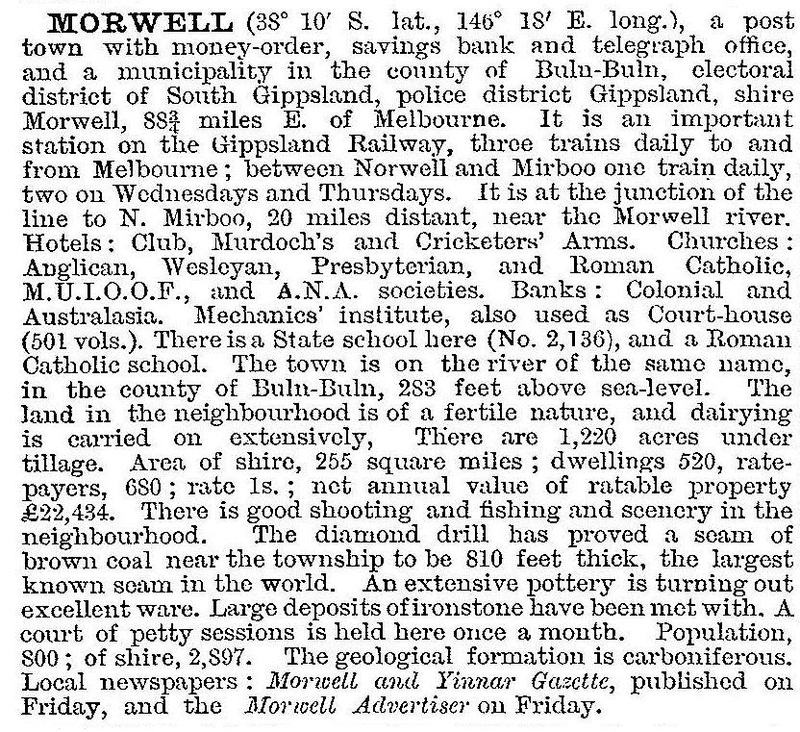 The origin of the name Morwell is uncertain. An Aboriginal word meaning woolly possum is favoured, but a number of locations in England have been suggested as the inspiration for the name. From 1844, pastoral runs were taken up along the Morwell River, which flows from the Strzelecki Ranges into the Latrobe River. The river was spanned in 1847 and in 1858 a hotel was established at the crossing, which was known as Morwell Bridge. By 1865, Morwell Bridge was a staging post on the coach road from Melbourne to Sale. However, when the railway line to Sale was constructed in the late 1870s, the railway station was sited on level elevated land several kilometres east of Morwell Bridge. In 1878, the first township blocks were surveyed around the station where a number of businesses were already established. These supplied the railway workers and travellers, as well as selectors who began to take up land in the area from the 1870s. A branch line to Mirboo North, south-east of Morwell, was opened in 1885. Morwell progressed rapidly in the 1880s, with a mechanics’ institute library and hall being constructed, as well as a post office, hotels, churches, schools and stores. Timber getting from the dense surrounding forests was a major industry, as well as building, brick making and pottery making. Several companies mined brown coal near the township from the late 1880s, and briquettes were manufactured for a while. Mixed farming and then dairying became the main agricultural pursuits, with a butter factory (1890) being established at Morwell. Morwell remained the service centre for a large agricultural district for a number of years. From 1919, 50 small farms were allocated to soldier settlers on the old Hazelwood run, south of Morwell. Some coal was mined occasionally until 1914, but in the early 1920s the State Electricity Commission began excavating brown coal by open cut methods north-west of Morwell, at the location to be known as Yallourn. A power station and briquette factory were constructed there and a new town grew. The influx of workers to Yallourn provided a stimulus to Morwell which grew steadily. As well, a paper pulp mill was established at Maryvale, north-east of Morwell, in the late 1930s. By the 1950s Morwell’s focus was industrial rather than agricultural. An open cut mine was worked immediately south of Morwell township. A power station and briquette factory were established, attracting other industrial enterprises such as a char factory and local gasification plant. The Housing Commission constructed over 2000 homes for the increasing work force, many of whom were migrants. The large labour force of women available attracted light industry, such as clothing manufacture. The shopping centre expanded onto the north side of the railway and highway. New primary schools were established – Collins Street (1951), Tobruk Street (1954) and Crinigan Road (1959). A high school opened in 1956, a technical school in 1959 and Maryvale High in 1969. Maryvale was at the forefront of innovative State education. From the 1960s Morwell gradually became the centre of commerce and industry in the Latrobe Valley, displacing Yallourn. Yallourn township was demolished in the 1970s, to mine the coal underneath the town. Morwell’s growth was also circumscribed by reservations on coal-bearing land, so development was mainly on a ridge north-west of the town centre, and later to the east. The power generation industry continued to grow. By the 1970s, Hazelwood Power Station, south of Morwell, was in operation, as well as two gas turbine power stations. In the 1980s, another power station was constructed at Loy Yang, south-east of Morwell, stimulating more ancillary industrial development. A regional shopping plaza was constructed in 1982, further increasing Morwell’s regional dominance, although competing with its own traditional business centre. Morwell has a large civic centre, library, hospital, art gallery and courthouse. The Gippsland Mail Centre is located in the town, as well as headquarters for the Latrobe Valley Ambulance Service and Gippsland Police District. There are numerous sporting and social facilities. Privatisation of the power stations from the late 1980s led to high levels of unemployment and much social distress in the town. The median house price of $56,000 in 1993 declined to $44,000 in 1996 which was 52% of the median price for country Victoria. In 2012 Morwell's median house price was $150,000, triple the figure 16 years before, but just 54% of the country Victoria median. The development of larger shopping centres at Moe, to the west, and Traralgon, to the east, lessened Morwell’s dominance of the Latrobe Valley. From being Morwell’s largest employer, power generation slipped to 3.7% of total employment (2011 census), less than employment in cafes and food service (5.5%). Social distress was still evident at the 2011 census with 25.5% of families being single-parent units (Victoria, 15.5%). Contrast with neighbouring Traralgon was also adverse. In 2011 single parent families in Traralgon was 17.1% and median weekly income as a % of Victorian median was 69.5% in Morwell compared with 100% in Traralgon. Not surprisingly, the State Government and Latrobe Council have concentrated stimulatory initiatives on Morwell. The industrial landscape of the Latrobe Valley is a tourist attraction. Powerworks is a museum and exhibition centre presenting displays and organising tours of an open cut and power station. Tours are also available over the paper pulp mill at Maryvale. Morwell is renowned for its centenary rose garden containing 2200 roses. Hazelwood Pondage, created to hold cooling water for the steam turbines at Hazelwood Power Station, is popular for water sports as its water is always warm. The Latrobe Valley Festival, held in March, comprises ten days of cultural activities. However, on 9 February 2014 a fire broke out at the Hazelwood open cut coal mine which burned out of control for over six weeks, blanketing the town of Morwell with hazardous smoke and ash. It was the state's worst coalmine fire. A judicial inquiry into the fire concluded that no buffer zone had been placed between the coal mine and the town, and that the fire was highly hazardous to health. The Victorian chief health officer had waited until 28 February to advise at risk residents to leave the town.